With the 50-JN01 laptop desk, one space addresses two common issues found in comparable mobile laptop computer desks: limited angle lock settings and instability. This desk adjusts to any angle you want and locks firmly in position. What's more, the Height adjustable frame is designed to remain stable at its tallest setting. Problem solved. For added mobility, the desk can Pivot freely to 70 degrees and features 5 smooth rolling casters, two of which lock into place. And both desk and mouse pad surfaces are made of durable, PVC laminate. An exceptional value, this desk is offered by one space, part of the comfort products family. With a history dating back to 1919, comfort products specializes in affordable brands for better living. If you have any questions about this product by OneSpace, contact us by completing and submitting the form below. If you are looking for a specif part number, please include it with your message. 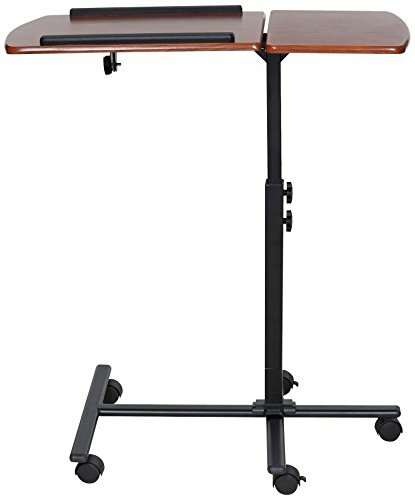 Stand Steady Original Standing Desk – Large Surface (23.5 in x 20 in) – New Taller Model with Non-skid Feet. Instantly Convert any Surface to a Standing Desk!